Straightening your teeth doesn't have to involve wearing ugly metal braces. When you choose Invisalign treatment, no one may even realize that you have braces. Matthew Karls, DDS, and Stanley Karls, DDS, of Karls Family Dentistry in Waunakee, explain how Invisalign can help you improve their smiles. Traditional braces use wires connected to brackets to gradually move teeth into the proper alignment. 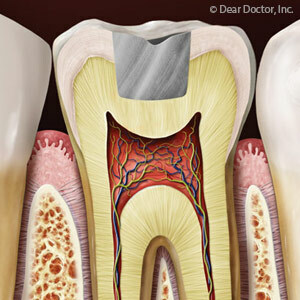 Brackets are cemented on your teeth, where they remain during the entire process. The Invisalign system accomplishes the same objective with a series of clear, plastic, removable aligners. The custom-made aligners are much more comfortable than metal braces and are a good choice if you prefer a more natural-looking orthodontia option. What flaws can Invisalign correct? Aligners are generally changed after about two weeks. You'll see your dentist about every six months to make sure that you're making good progress. How long do I have to wear Invisalign aligners? If you're an adult, you may only have to wear the aligners for about a year. Teenagers generally wear Invisalign aligners for the same amount of time they would wear traditional braces. The aligners are usually worn for approximately 20 to 22 hours per day. There's a long list of foods you can't eat if you wear metal braces, but Invisalign wearers can wear anything they want. Since you remove the aligners to eat, no foods are off-limits. If you live in the Waunakee area and think Invisalign offers the clear solution to your problems, call Drs. Matthew and Stanley Karls at (608) 849-4100. Thanks to Invisalign, you don't have to be self-conscious about your smile any longer.